You Put Your Jewels In the Cloud With No Firewall? 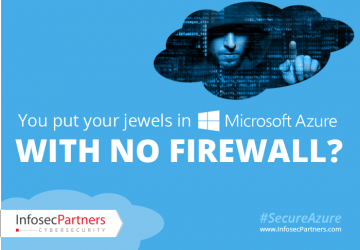 You Put Your Jewels In Azure With No Firewall? Are you placing your jewels in an Azure cloud environment without your own firewall? No matter which cloud platform you are using, there is always the potential for threats within the cloud environment. Software as a service (SaaS), Platform as a service (PaaS) or Infrastructure as a service (IaaS) will each have their own security concerns that need to be addressed and Infosec Partners can help. As proven partners of excellence and full-spectrum security experts, we’ll put your security first.